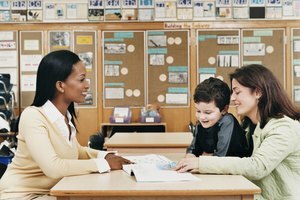 Open communication is one goal kindergarten teachers should keep in mind. While it's important to help set goals for your kindergarten students to strive toward, kindergarten teachers need to have their own set of goals as well. A kindergarten teacher's goals should be set to ensure that they provide a calm and effective learning environment that allows students to develop. A well-rounded curriculum is a goal kindergarten teachers need to keep in sight. While school districts will usually provide guidelines for curricula, the teacher must set out a plan for teaching each subject in an effective and cohesive manner. Subjects for kindergarten may seem simple but are important building blocks for future schooling. Subjects include an early introduction to reading and math, as well as the alphabet, counting, and basic social skills. Another goal of a kindergarten teacher is to keep the classroom neat and orderly to provide a safe and effective learning environment. This can include developing a seating chart, stations for all of the learning tools such as a story time area, painting area or naptime area, and arranging student desks in a functional fashion. Part of keeping this goal is also cleaning the classroom daily, including putting away supplies after they are used, and straightening the desks and chairs. Developing open communication with students is important for kindergarten teachers. Good communication not only helps your ability to teach and communicate information easier but also allows you to keep a closer eye on students and evaluate progress. Communication is also important with the parents of your kindergarteners. Learning isn't limited to the classroom. Having open communication with parents can ensure that learning continues at home. It can also help make sure that any learning disabilities or behavioral issues are addressed both in school and at home. Young children are just beginning to develop social skills, and conflicts among them will arise in the classroom. A kindergarten teacher needs to be able to assess conflict and resolve it fairly. This requires patience and the ability to see all of the positives and negatives of a situation in order to ensure successful and unbiased conflict resolution. 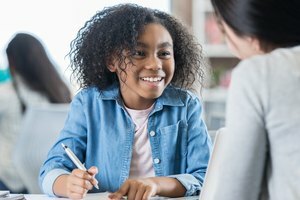 You should model good conflict resolution practices to students and help them to develop their own abilities to resolve disputes. Davidson, Amy. "Goals for the Kindergarten Teacher." Synonym, https://classroom.synonym.com/goals-kindergarten-teacher-8561367.html. Accessed 23 April 2019.